The past month has been odd for me. I have been advocating UW Merfolk forever, but almost every other Fish player is mono-blue. It made sense. Perfect, painless mana all the time is really appealing. Then Ixalan happened and everyone is experimenting with other colors. I’m not complaining but it feels weird. The fact that they’re still not talking about UW is a little frustrating. Instead, it’s UG that’s getting attention. And fair enough, that’s what Wizards, weirdly, decided for Ixalan’s Merfolk. I guess they all became druids while I wasn’t looking. And that’s fine. Lots of people go through that phase in college, why would fish-people be any different? That said, after the initial excitement faded so did interest in altering Merfolk. Players are still experimenting, but the widespread interest seems to be gone. I think that the lackluster early results put a lot of players off. Things that are merely good rather than amazing tend to fade from view. The thing is, I think UG is perfectly fine. You have to adjust your expectations somewhat, but it does work. It just depends on what you want from the deck. While there are a good number of Merfolk in Ixalan, most aren’t Modern-playable. This is not surprising, really—Modern is far more demanding than Standard, and that’s what Wizards designs for. There are just three Merfolk worth considering. Merfolk Branchwalker – The main draw. Silvergill Adept is the best card in Merfolk, and Branchwalker is most of an extra copy. Not quite, but close. As a result, most of the speculation has revolved around this card. I’ve been testing Branchwalker extensively and my conclusion is that explore is about 60% of a cantrip. Scry 1, give this creature a +1/+1 counter is okay, but not really a card. But you do get to draw lands, which is fine. It’s just a fine card. Kumena’s Speaker – The aggressive one-drop that Merfolk didn’t have. A lot of criticism of Merfolk has focused on its curve being so two-drop-heavy. Speaker promises to change that, though I don’t know if…he?…can keep that promise. One-mana 2/2’s aren’t that impressive anymore (thanks, power creep) and the two-drops are all pretty important. That said, smoothing out the curve to be more aggro than tempo is nothing to dismiss. Kopala, Warden of Waves – Finally, the card that is of most interest to players who don’t understand Merfolk. Or Modern. I believe the speculation that she will replace Kira, Great Glass-Spinner is wrong—Kopala is much worse. Most removal in Modern costs one mana, which means her ability is annoying, but not burdensome. And irrelevant in the late game. You are much better off maindecking Kira. However, as a sideboard card Kopala has promise, as she’s very effective alongside Kira. Requiring two spells and four extra mana to kill a creature is very good. I’ve run an extra Kira in my sideboard forever, and against decks like Jeskai control I would happily take Kopala instead of Kira the third. So two possible maindeck inclusions and a sideboard card. Not much, but enough to get players talking. And then not actually doing much with the cards. Part of the problem is that it’s hard to brew with Merfolk. There isn’t much you can change because Fish has a very large core. By this I mean that there are a lot of cards that you have to play in every deck. Without them, the deck’s identity begins to erode and the strategy weakens. It can be done, but you need a very good reason to do so. Let’s consider a typical mono-blue Merfolk deck based on what I’ve recently seen being played. Most Merfolk decks look extremely similar because they have to. Otherwise they wouldn’t be a tribal aggro deck. This is a large core at work. It’s best to think of this like Earth’s crust. I could have sworn we’ve covered this before, but I can’t find the article, so I’ll explain here. These 24 cards make Merfolk Merfolk. If you want to get technical, there is an inner and outer core, which are the creatures and non-creature spells respectively. It’s a distinction between the key cards and their key support. The creatures represent the two best individual Merfolk and the two best lords. Vial is the mana engine/tempo booster that makes the deck viable, and Seas is a disruptive card that facilitates evasion. They’re what makes any Merfolk deck good. And it’s over a third of the deck—60% of the non-land cards. That doesn’t leave much room for other things, and there are plenty of cards that you still need in Merfolk for the deck to function. Mantle cards are important cards that make the rest of the deck better. They synergize with the core, amplify its effects, and/or compliment the strategy in an intrinsic way. In other words, they’re cards that you almost always play in the deck, but they’re not critical or always four-ofs. Reejerey is the other good lord, and it can become a mana engine when the stars align. It’s expensive so it sees less play than other lords. Harbinger is the other best two-drop. It’s a fine tempo card, but its main job is curve filler with upside. It can be a big upside, but that’s just gravy compared to being a two-mana Merfolk. Kira is the best removal protection around and is critical for a deck that absolutely requires lords in play to function. You need these cards to make the core work, but you don’t need the cards to play the deck. Crust cards are the hangers-on and flex-spots. They’re not intrinsically valuable or even that powerful, but you get value by having them in you deck, either through power boosts or hole-filling. Your deck gets better because you have them, but if you don’t, the core strategy isn’t harmed. Dismember is my stand-in for the flex-spot, and I don’t think it’s controversial to say that any instants you play are crust cards. They exist to fill holes in your linear tribal-aggro deck. Mutavault is a creature-land, and not one you’d play normally except that it benefits from tribal synergies. The deck works just fine without it, but is unequivocally better for its inclusion. Master of Waves is a parasite, and as I’ll discuss later, I don’t think it’s a necessary one. Master’s only connection to the rest of the tribe is his creature type. He only cares about the blue pips in the upper right corner of the card. Put him in another blue deck with lots of permanents, he’d be just as good. Therefore, the Merfolk crust is ten cards, four of which are lands. That’s not much to work with. Even if you stretch into the mantle, you don’t gain many slots to mess with. Look back at my history with Merfolk—I never shave more than four cards from the mantle. That’s not much room for a brewer to maneuver. For many, this kills the interest. It doesn’t matter how much work you put in, you’re just not going to leave much of a mark. I see this as a challenge. Given our limited space and the requirements of the deck, the key isn’t to massively change the deck. It’s about adjusting how you approach the cards and how they reposition the deck. Another barrier to acceptance is that the new cards push you into green. I don’t know if you know, but there’s this really busted card in green called Collected Company. Company works really well in creature decks, and Merfolk is a creature deck. Therefore it would stand to reason that Company would be good in Merfolk. It hasn’t been. Up until now Company has never done enough to warrant inclusion. See, Company is at its best when you’re cheating in more than four mana’s worth of creatures, preferably ones with enters-the-battlefield triggers. That isn’t going to happen in Merfolk. Also, to stretch into green you’d have to play Breeding Pool and weaken your matchups against other aggro decks. Therefore, the community consensus is that Company is unplayable in Merfolk. I’ve never been one to accept conventional wisdom at face value, and in this case I believe that I’m right to do so. As I mentioned above, Company is a broken card (Wizards admitted it wasn’t really tested). This has led to it being the lynchpin of broken decks in both Standard and Modern. And yeah, it will be better in broken decks because they’re broken decks. Whether it’s a Bant value deck or Counters Company, if you’re already doing something powerful, doing it instant speed at a discount is better. However, what if you’re just looking for a way to find and play more creatures? It’s not as good. But it’s not bad to use the card as it was (supposedly) designed. If you’re going to try and play Collected Company in Merfolk, you need to make some changes. First of all, the Master of Waves needs to go. It’s not a hit for Company, and they’re both four-drops in a deck with 20 lands. There’s no room. Also, I don’t think Master is that good anymore. Going wide has not been working out for me like it used to. If you have a good devotion count against most decks these days, you’re probably winning anyway. Also, most of the removal is white and black instead of red, making Master far more fragile. The ability is less relevant and less likely to matter anyway. I gladly cut the card so we can run Branchwalker. Some have said that you should cut Vial for Noble Hierarch as well, but this seems poor. Hierarch is mana acceleration. Vial is a tempo booster. Tempo is far more valuable to Merfolk than acceleration. The old school Abzan Company ran around 12 non-creature spells anyway, so we should be fine. Remember, we’re not trying to maximize Company, we just need the value. This deck was fine. It wasn’t great in my testing but it wasn’t bad either. Company was a perfectly fine replacement for Master, and I didn’t miss him in any games. Branchwalker was also a fine card. Not a standout, but fine. The thing is, that result is deceptive. In a different metagame, this style is the Merfolk deck to play. It just doesn’t run out of gas. Ever. You have twelve cantrips and Collected Company to make sure the creatures never stop flowing. As long as you demonstrate basic discipline and don’t overextend, you will wear down any attrition deck. You just have too many two-for-ones built into the deck. And with some tuning you could add more. If midrange Jund and true Jeskai control make comebacks, this is what I’d throw at them. They just won’t wear me down. Go over me, maybe. But not outgrind me. Of course, that’s not the metagame we face right now. Card advantage is far worse than tempo and velocity. Company doesn’t really help with those here. You’re not gaining mana, really, and you aren’t accelerating. Grixis Death’s Shadow and Eldrazi Tron won’t care about your cards while they overpower you, while Counters will use Company like it’s actually meant to be used to just break you. But if that ever changes, take another look. With that in mind, you’re better off not going for Company and instead going more aggro. I’ve had far more success switching out Company for Kumena’s Speaker and just going full creature rush. This also lets you naturally go wide without relying on a 2/1 and improves your goldfish by a fraction of a turn. It’s noticeable, but hard to quantify. The problem is the mana. You’re much more vulnerable to Burn and getting raced than before. This is just the price of fetch/shock mana bases. We’re gaining stability, thinning, and a flatter curve in exchange for vulnerability to Burn and the severely underplayed Blood Moon. 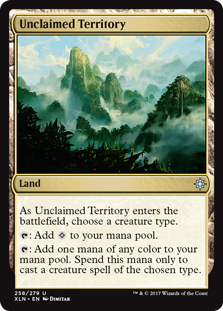 As an alternative, you can go pseudo-colorless by using Cavern of Souls and the strictly-worse Unclaimed Territory instead of Misty Rainforest and Breeding Pool. You don’t take damage, can effortlessly cast all your Merfolk, and you sometimes get value when Jeskai players mistake your announcing Territory mana as Cavern mana. The problem is that you severely limit your access to actual colored mana which limits your sidebording options. You can’t board in green cards, you don’t have enough mana sources. Blue is plausible but still risky (only 8 sources). Colorless is fine but there aren’t many options Merfolk actually wants. It may not be worthwhile, but it presents interesting problems that I will certainly enjoy tackling. Despite the difficulties, I strongly believe that UG Merfolk does have a place in Modern. 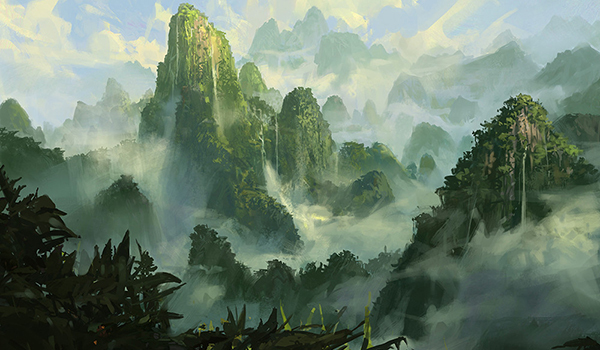 What that place is will depend on solving the mana question and on the continued nature of the metagame. Considering that Wizards seems really excited about mono-green Merfolk, I suspect that color will get the power in the next set too. So if you want to update your list, now’s the time to get working. Have you had a different experience? I’m eager to hear it in the comments.